The Apprentice! Who will win! 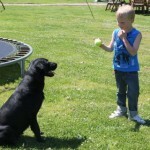 Fallowfen Gundogs is looking for an apprentice, but there can only be one winner!! 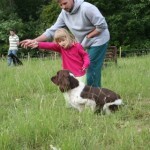 My up and coming gundog trainer getting a few tips! 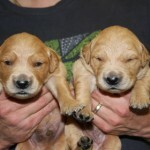 Working Labrador Retreiver puppies due 21st June 2011. 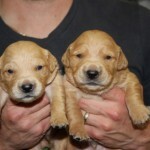 Labrador Retriever litter due 21st June. We are now registering interest. 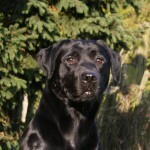 Millie and Digger have been matched to hopefully produce black and yellow puppies that will be good compact Labradors with sound temperaments and bold healthy puppies. 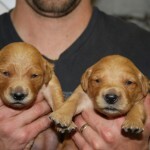 Both parents bidable working Labrador retrievers but also excellent family companions. Brocklebank Kitty AKA Millie, is the mother to be and has a low hip score of 7 and a current clear eye certificate. 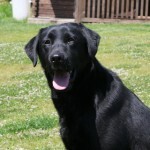 Millie has a soft temperament and is always willing to please and loves a cuddle. 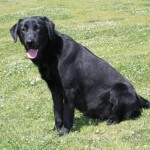 Calderhey Digger AKA Digger is the expectant father. 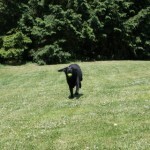 He also has a low hip sore of 10 a current clear eye certificate and elbow score of 0. Diggers working ability strengthens daily and is a strong member of our picking up team. 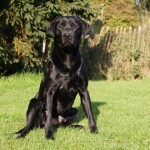 Between Millie and Digger they boast some famous kennels within their pedigrees such as Brocklebank, Drakeshead, Flashmount, Willowyck and Brindlebay to name but a few. 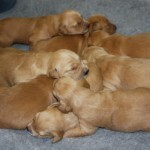 All puppies are home reared with young children and other animals. 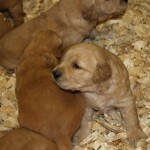 All puppies will be kennel club registered and come with a kennel club accredited breeder pack. All our Labrador puppies will go to their new homes after having a veterinary health check, first vaccination and microchip. 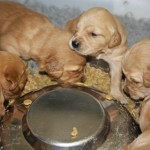 Our Labradors pups will be wormed at 3, 5 & 7 weeks of age and will be reared on Royal Canin puppy food. 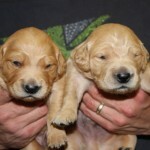 If you would like any further information on this up and coming litter please feel free to contact us. Millie starting to look pregnant. 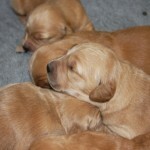 Bess’s puppies are now just over 3 weeks old and growing fast. 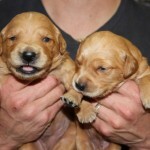 The Goldie pups have been eating solid food for the last 6 days a combination on Royal Canin Maxi starter puppy food with the Royal Canin puppy mousse, which has eased the pressure a little for their mum. All puppies had their first dose of there worming program this week, they were wormed with Drontal puppy wormer and Bess was wormed with Drontal adult wormer. 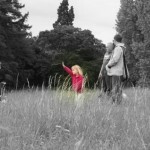 Here are a few pictures from the last to weeks. 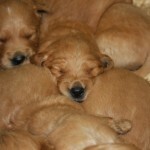 Goldie puppies 1 week old. 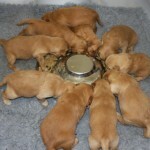 Golden retriever pups first solid feed. Taken today just over 3 weeks old.